In this fascinating book about religion in America, one of this country's most probing yet sympathetic journalists puts forth stories not only of real grace but of despair, sexual scandal, and attempted murder. 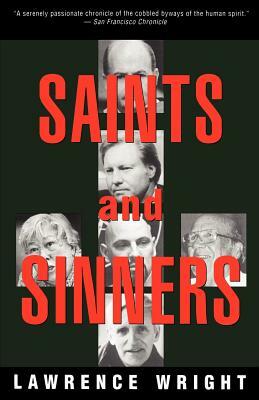 Lawrence Wright's Saints and Sinners are Jimmy Swaggart, who preached a hellfire gospel with rock 'n' roll abandon before he was caught with a, prostitute in a seedy motel; Anton LaVey, the kitsch-loving, gleefully fraudulent founder of the First Church of Satan; Madalyn Murray O'Hair, whose litigious atheism sometimes resembled a brand of faith; Matthew Fox, the Dominican priest who has aroused the fury of the Vatican for dismissing the doctrine of original sin and denouncing the church as a dysfunctional family; Walker Railey, the rising star of Dallas's Methodist church, who, at the pinnacle of his success, was suspected of attempting to murder his wife; and Will Campbell, the eccentric liberal Southern Baptist preacher whose challenges to established ways of thinking have made him a legend in his own time. By letting us listen to their voices and see the individuals in all their complexities, Lawrence Wright has written a richly fascinating book about the passions, triumphs, and failures of the life of faith. Lawrence Wright is a staff writer for the New Yorker and the author of nine books of nonfiction, including In the New World, Remembering Satan, The Looming Tower, Going Clear, and Thirteen Days in September, and one novel, God’s Favorite. His books have received many prizes and honors, including a Pulitzer Prize for The Looming Tower. He is also a playwright and screenwriter. He and his wife are longtime residents of Austin, Texas. "Trenchant, fair-minded, gracefully written....Wright brings his subjects into sharp focus with plenty of perceptive details." "An entertaining, and insightful account...vivid...beautifully rendered stories."